In need of a new rainwater head? Perhaps your existing head needs repair? Custom Fascia and Spouting are experts in installing rainwater heads on both new and existing spouting systems. We will ensure our work will not only compliment the decor of your home or business but stand the test of time year after year. Contact us to receive your free rainwater head installation quote. Our team of experienced and knowledgeable workmen are equipped to offer rainwater head repair services throughout Auckland and Bay of Plenty. Regardless of the style of your existing rainwater head, we can ensure your repairs look as good as new. We guarantee our workmanship on all rainwater head repair services. Contact us today to request rainwater head repair quote. At Custom Fascia and Spouting we offer a range of rainwater heads in standard and custom made designs. 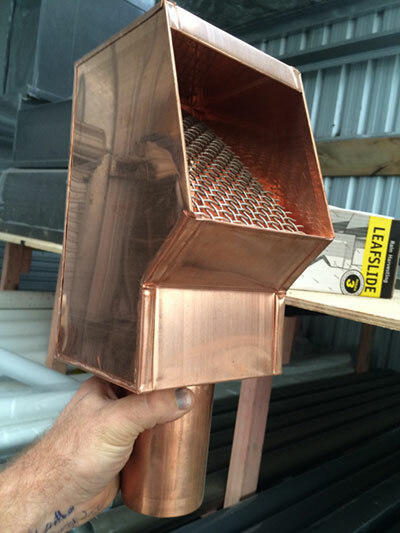 Our rainwater heads are available in colorcote, copper, aluminium, titanium zinc and stainless steel and our rainwater systems are available in aluminium, titanium zinc and stainless steel for superior strength. If you want custom rainwater head services done in Auckland or the Bay Of Plenty call Custom Fascia and Spouting today. Looking for Rainwater Head Installation or Repair Services in Auckland?